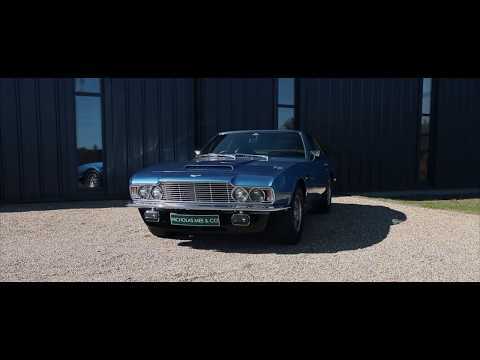 Proclaimed at its launch as one of the most powerful production cars in the world, the Aston Martin DBS V8 went on to become immortalised by Lord Brett Sinclair, in the popular TV series The Persuaders. Built for just under two years, just 402 examples were constructed, prior to the introduction of the AMV8 in 1972. The car we are delighted to offer, a 1971 car, has remarkably had just 3 previous owners, the first for some 35 years and covered only 72,000 miles from new. Finished in its original colours, the original interior hides have been beautifully preserved and imbue the car with that air of authenticity, and quality often lost when renewed. Chassis restored and body repainted 7 years ago, maintenance has been entrusted to highly respected Aston Martin specialists to exacting standards. With detailed service invoices and a photographic record of the chassis and body restoration, testimony from the previous long-term keepers, factory build details and even early tax discs, this extremely well presented DBS would complement any collection and be a worthy entrant in any concours event or tour.